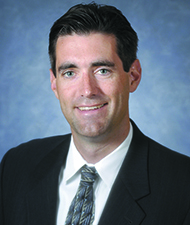 You are here: Interventional Radiology/Sean M. Carr, M.D. He is a graduate of Oregon Health and Sciences University. He is Board Certified by the American Board of Radiology in Diagnostic Radiology. He completed an Interventional Radiology Fellowship at the prestigious Dotter Interventional Institute. Additionally he is CAQ certified by the American Board of Radiology in Interventional and Vascular Radiology. .
Dr. Carr has been with Boise Radiology group since 2004. He performs all spectrums of interventional radiology. A main focus of his practice is work with oncology patients. Including biopsies, ablations (Radiofrequency and Cryoablation), and embolizations. He also has focused his expertise on patients with Liver and Renal disease. .
Dr. Carr enjoys spending time with his wife and children. He enjoys all outdoor activities. He is a lifelong native of the Pacific Northwest.